Fanduel Fantasy Football Guide For Dummiers and err…. You! FanDuel continues to be one of the dominant players in weekly and daily fantasy football. Along with DraftKings, it controls the lion’s share of the action. If you’ve been playing fantasy football for any length of time, there’s a good chance you’re already a satisfied FanDuel customer. But that doesn’t mean you’re aware of all of features at your disposal. 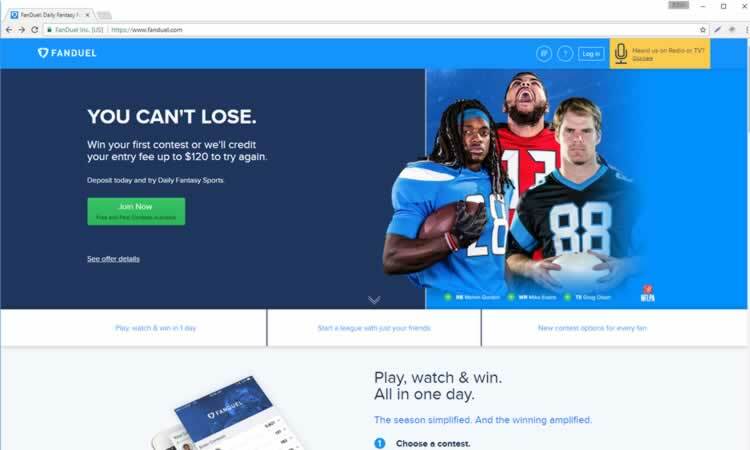 FanDuel recently went through a complete site design overhaul, and during the process added a few features that make playing fantasy football simpler and more engaging. Below, we’ll cover several of them in detail. You’ll find that these new features will help you to squeeze more mileage out of your FanDuel fantasy football experience. Beginner Only & No “experienced” players. If you’re new to FanDuel, or new to 1-week fantasy football altogether, this feature will be invaluable to you. FanDuel recently added a “Beginner’s Only” tag to select contests. They added this last year but I highly recommend all new players take advantage of these tourneys. Access to the games is restricted according to your track record on the site. As a rule, if you’ve competed in 50 games or fewer at FanDuel, you’re given full access. Otherwise, your access is blocked. *If you have won more than $2500 in this time you are no longer considered a beginner. What if you’ve lost count of the number of contests you’ve played since joining the site? How do you know whether you have access to these games? Simple. While you’re in the lobby, take a look at the right side of your screen, right above the list of contests. See the “Beginner Contests” button? Click it. Then, try to enter one of the games in the resulting list. If you can, you have access. It’s worth noting that FanDuel may remove your access if you manage to win a sizable chunk of money. For example, suppose you enter a GPP (guaranteed prize pool) tournament and walk away with a $5,000 win. You’ll no longer be considered a beginner, even if you’ve played in fewer than 50 games. Playing the beginner contests gives you a chance to learn the ropes without worrying about the sharks (i.e. experienced team owners). You can play with confidence that you’ll be competing with FanDuel customers who are at your same skill level. After you compete in 50 contests, you’ll no longer have access to the beginner events. At that point, you’ll be expected to compete in leagues where team owners have more experience. “Experienced Players Excluded – Ok so this is interesting in the fact that if you are a regular casual player you can avoid playing against the professionals and experienced guys. I chatted with live customer support asking what the difference was between “Beginners Only” and “No Experienced Players” and essentially it means that you will not be playing against the ‘grinders’ or the ‘regulars’. You can see how FanDuel distinguishes players in tiers now and flags players with flair if they are experienced or ‘highly experienced’. It’s part of Fanduels move to cater more to the average player. If you’re just getting your feet wet with fantasy football, be wary of competing against the pros. Their experience gives them a big edge. FanDuel’s beginner contests allow you to play in the shallow end, safe from the sharks. Remember, accomplished team owners are prohibited from competing in the events. But once you venture outside the beginner contests, you’ll be competing against seasoned players. That can be scary, especially if you don’t know who you’re up against. In the past, it was difficult to figure out the experience level of a given team owner. Had he competed in 10 contests or 1,000 contests? Had he won a considerable percentage of the events? Did his track record show thousands of dollars in winnings, suggesting he was a tough competitor? There was a lot of uncertainty. Choose the “NFL” tab and access the tournaments. Click on the title for one of them. You’ll see a box that displays the upcoming games and scoring data (the number of points awarded for offensive and defensive plays). You’ll now see a list of the team owners who have entered the tournament. Notice that some of them have blue stars surrounded by blue circles next to their names. That emblem means they have a lot of experience. They’ve played in at least 500 contests or have won at least $2,500 across six or more events. Notice that some entrants have a white star contained within a blue circle next to their names. That emblem means they’re considered to be “highly experienced” at FanDuel. They’ve played in at least 1,000 contests or have won at least $1,000 across four or more events. With this feature, it’s no longer a mystery who you’re playing against. Whether you’re competing in a large-field tournament or small-field 50/50, you’ll have a good idea about your competition. Bottom line: if a large percentage of the field is made up of experienced or highly experienced team owners, you’ll know that you have your work cut out for you. Incidentally, if you take a look at the beginner contests, you’ll notice that none of the entrants have either of the two emblems described above. That’s as it should be since experienced team owners are prohibited from entering these events. Easy to find, join and play a contest of your choice. One of the problems of the past at FanDuel was that there were no limits on the number of head-to-head (H2H) contests a person could enter. Consequently, a single team owner could – and often would – join a ton of H2Hs, limiting the breadth of challengers others were exposed to. For example, suppose you created 30 H2Hs in the hopes of squaring off against 30 different competitors. In the past, a single competitor could join all 30 of your contests, dashing your hopes. This is less likely to happen at FanDuel today. The site has implemented limits on H2Hs. With regard to the global limit, a team owner is allowed to enter up to 5,000 NFL contests per slate. However, for contests with entry fees set at $10 or less, the limit plummets to 500 per slate. This helps a bit. But the real effect is seen with the public H2H limit (#2 above). FanDuel limits the number of NFL H2Hs a team owner can create or join according to the size of the entry fee. In other words, they’re prevented from carpet-bombing the low-fee H2H events. That helps to ensure other team owners have an opportunity to play against a wider selection of competitors. If you’ve shied away from head-to-heads in the past because a few team owners seemed to monopolize them, now’s the time to give the area another look. Most large-field tournaments allow team owners to create multiple lineups. A lot of people love these events because they can create several teams on the cheap, and in doing so boost their chances of winning a payday. You’ll often see the pros doing this. They’ll create dozens of lineups for a single large-field event. It’s no accident that they tend to win more than their fair share of tournaments. But what if you’re a novice and feel uncomfortable about the notion of creating a large number of teams? What if you’re not ready to compete against experienced fantasy players who create 20, 30, or more lineups for a single tournament? There’s good news at FanDuel. You can now use a special filter on the site to find contests that only allow a single entry. Under the NFL tab, access the “Tournaments” section. To the left of the list of tourneys, you’ll see a box that says “Entry Type.” Choose “Single Entry.” The list will be refined to show only those contests that allow one lineup. Let’s say you’ve been playing single-entry events for awhile and want to test the waters in a multi-entry event. But you’re not yet ready to jump into the deep end with owners who create dozens of lineups. You want to work up to that level. There’s more good news. FanDuel not only offers capped contests, but makes finding them easy. Select “All” in the box labeled “Entry Type.” Then, scroll down the list of tournaments. You’ll notice several that are capped at three, five, or 10 entries per team owner. These events provide a great training ground if you want to learn how to compete with multiple lineups without diving into the deep end with the pros. Let’s say you’ve created the perfect lineup for the week’s scheduled games. You have a lot of confidence your squad will deliver. In fact, your confidence is so high that you’d like to use that same lineup across a swath of different contests for the same slate. In the past, this was a cumbersome task. You’d have to rebuild the lineup for each contest. It was easy to do so, but time-intensive. No longer. FanDuel has added a feature that allows you to “port” your lineup to multiple events using the same slate. For example, suppose you’re competing in a 50/50 and want to use the same lineup in a small-field, winner-take-all league during that same week. You don’t have to rebuild your team. Once you’ve created it the first time, simply port it to the other event. Set your lineup in the 50/50 (or whatever contest you’ve chosen to enter). Once you submit your lineup, a box will pop up on your screen confirming the submission. It’ll display the players you’ve chosen for your squad. You’ll also see a list of contests displayed below your squad. Scroll down until you find the small-field, winner-take-all contest you want to enter. Once you find it, simply click the green “Enter” button to the right. Your lineup will be entered into the second event. Again, you no longer have to spend time rebuilding your team. We have a growing list of fantasy football tips and strategy articles. You can read all of them at your leisure but I personally like the articles on picking a kicker and defense on Fanduel. It is one of the differences between Draftkings fantasy football and Fanduel fantasy football. On Draftkings you do not have a kicker. On Fanduel, you do. There are a lot of reasons I enjoy playing weekly fantasy football at FanDuel. One of them is that the folks who run the site are always looking for ways to improve the experience. The evidence is in the raft of new features I’ve described above. If you’re not yet playing fantasy football at FanDuel, I highly recommend creating an account.